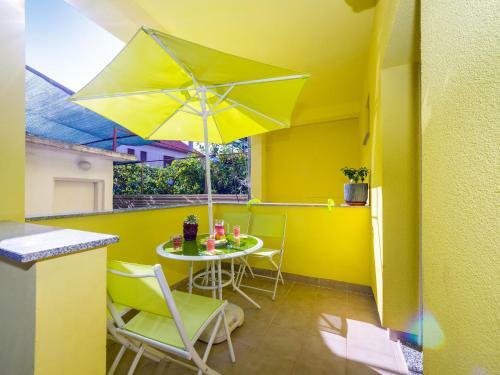 Apartment Ulica Rijecka is situated in 11 Rijecka ulica in Zadar only in 1.6 km from the centre. The Apartment provides easy access to Knight's Palace, Zadar City Gate, Old Port of FoÅ¡a. The closest Zadar Airport is in 8.7 km from the hotel. Among a wide range of guest services are: BBQ facilities, internet services, parking space. Payment for services is possible with bank cards: Visa, Mastercard, Carte Bleue. Staff talks in Portuguese, Italian, French, Spanish, English, German and Arabic. For your comfortable accommodation is offered only one room type - apartment. Guests can count on such amenities as air conditioning, refrigerator, ironing facilities, microwave, washing machine, electric kettle, dining table.